The rabbi pleaded for mourners on Facebook. Here’s what happened. BALTIMORE (JTA) – The 30 or so people assembled at a shaded gravesite on a cloudy, early Friday morning probably didn’t know how much they would be moved. Alongside an open grave, nine men stood to the right of Rabbi Yisrael Motzen, the funeral’s officiant. They had responded to Motzen’s appeal late the previous afternoon on the Facebook page of his synagogue, Ner Tamid. Motzen had erred – these people were her family and friends. In the early 1940s, at age 4 or 5, Schulman was stricken with encephalitis, which caused permanent brain damage, according to a source at Chimes Maryland, the nonprofit organization in whose group home Schulman lived. 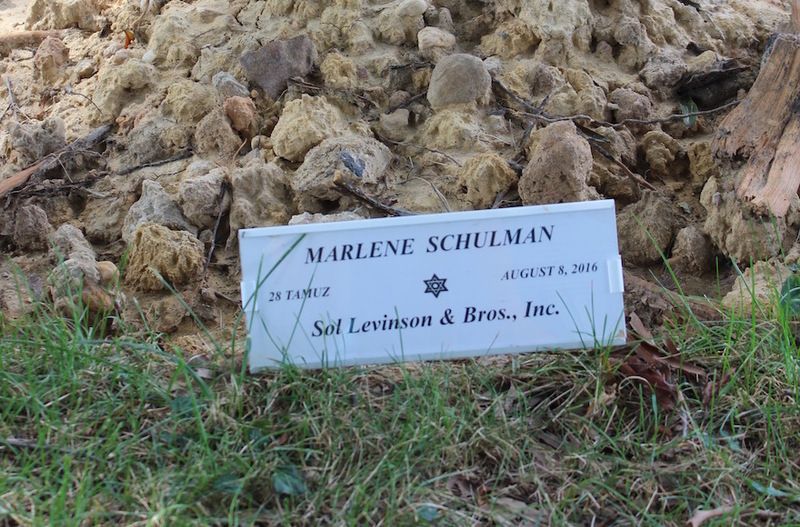 Schulman’s parents, Herman and Irene, institutionalized her in Vineland, New Jersey. When Herman became ill and could no longer pay for the private care, he and Irene moved Marlene back to Maryland in 1981 to live as a ward of the state. Obituary notices placed in Baltimore’s Sun newspaper for Irene in 2005 and Wilma, the older sister of Marlene by five years, in 2011 make no mention of Marlene. An obituary could not be found for Herman, who died in 1981. The trio is buried together at Baltimore Hebrew Congregation’s other cemetery, in suburban Reisterstown. On Sept. 2, “Seeking Kin” located Mark Schuster, Wilma’s son. Schuster said he had been told decades earlier that Marlene, his aunt, had died. Many years before that, Irene had reluctantly confirmed his suspicion of her having another daughter. More recently, his online search for Marlene came up blank. Had he known of his aunt’s existence all these years, Schuster said, “I could have gone and visited.” He plans to contact Chimes to learn about her and the life she led. Miriam Goliger, a Chimes employee who attended the funeral, said in a subsequent interview that Schulman “always smiled and asked how you were,” projecting warmth even though “she had what to be upset in her life about.” At the same time, she was “feisty” and spoke up for herself, Goliger said. At the funeral, Motzen posited that we cannot grasp what Schulman’s role on Earth might have been, but that the incoming month of Av being celebrated that very day offered a lesson: Perhaps, like the new moon, Schulman lived for the positive purpose of reflecting others’ light rather than projecting her own. The medical director of the organization, likewise, confessed to not knowing Schulman. He read a poem and prompted the mourners to pronounce “Marlene” at the end of each pithy line about witnessing sunlight and seasons and leaves on the ground and other natural marvels. Another employee spoke. The rabbi explained to the Chimes contingent, most of them not Jewish, that their escorting Schulman to her final resting place was a “chesed shel emet,” the ultimate kindness, because the beneficiary could never reciprocate. The mitzvah, he continued, included partaking in the burial. Turning to his right, Motzen took a hand spade and gently invited Schulman’s caregivers and friends to participate. An elderly man shuffled ahead, supported by Goliger and another aide. He took the spade, which the two women also held. They guided his hand toward the dirt, scooped some and overturned the spade onto the grave. “Good job, Walter,” one of the women said as they strolled back. A hush prevailed after the Mourner’s Kaddish was recited. Motzen noted later on Facebook that it may be the only time the prayer would be said for Schulman. “I’m glad that our community was able to provide a certain level of dignity and a proper funeral,” said one attendee, Harry Burstyn. A few of Motzen’s other recruits approached Goliger. They had noticed some of the women, Schulman’s housemates, crying at the graveside. They asked if they could volunteer at the homes or visit the residents.